Home › Blog › A Return to Calm and a Big Thank You! A Return to Calm and a Big Thank You! 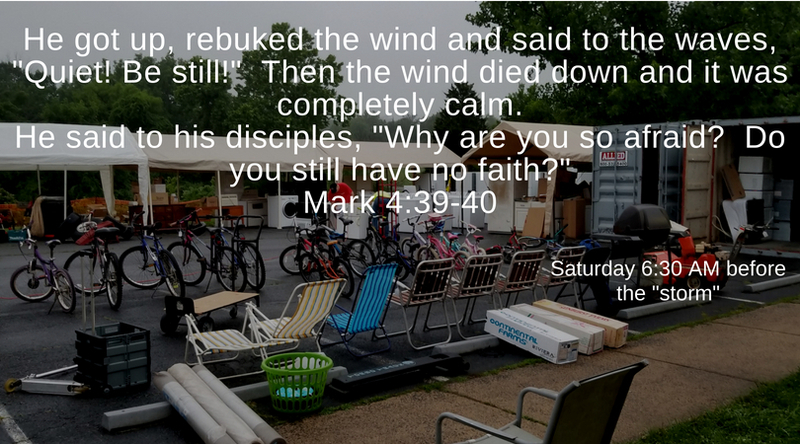 He got up, rebuked the wind and said to the waves, “Quiet! Be still!” The wind died down and it was completely calm. Thanks to everyone who supported our annual fundraiser with donations, volunteer time, and purchases. We were blessed with another successful year. Proceeds from this event will go back into the Sterling community by supporting Mission efforts such as GRACE Ministry and Backpack Buddies. Since it is the first Sunday of the month, Communion will be served at all services. All are welcome to participate in Communion. Our Traditional Service is at 9 AM which will include a children’s moment after which the children will go to Summer Sunday School. At 10 AM our Amigo’s Service occurs in the sanctuary in Spanish. Then at 11 AM we have our Contemporary Service with our Praise Band. We hope you will share some time with us this Sunday!